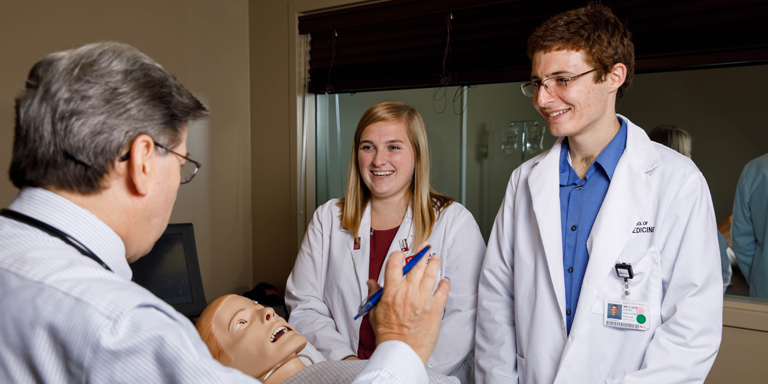 At the IU School of Medicine–Fort Wayne, we’re preparing the next generation of healers and transforming health and wellness in Indiana and beyond. As part of one of the top medical schools in the country, we offer a positive, inclusive teaching and learning environment, an innovative curriculum, exceptional translational research, and strong clinical partnerships for patient care. Our faculty are national experts in their fields, and you’ll have opportunities to work with them one-on-one. Our small class sizes, student mentoring program, and access to some of the best hospitals and clinical care facilities in the region mean you’ll get the kind of personalized education and support that will help you to be the best health care provider you can be. With a degree in medical imaging and radiologic sciences from IU Fort Wayne, you’ll be ready for a career in one of the fastest evolving professions in health care. You’ll use radiation, sound waves, magnetic fields, or radio frequencies to diagnose and treat patients. Our simulation facilities and clinical partners will give you hands-on experience with modern, high-tech equipment, so you’re ready to work with patients on day one of your career. At IU Fort Wayne, we offer IU’s only entry-level Bachelor of Science in medical imaging and radiologic sciences. While other programs offer associate degrees that lead to a bachelor’s program, at IU Fort Wayne you can get started on your bachelor’s degree now. Looking for more information about studying medicine or medical imaging at IU Fort Wayne? Still have questions? Contact one of our advisors.